In some respects, I followed Jack's desire to find out more about these Royal Mersey Restricted Class boats. Jack wrote to many people to find out about the pedigree of the vessel he had bought and learned to sail. I've copied below an article he wrote when he found 'Avis'. It's fascinating to read, and I've also linked an extract from a local Merseyside newsprint which shows the pride he had for his beloved 'Avis'. 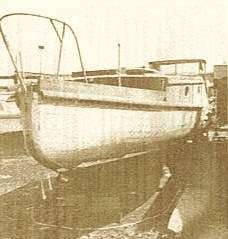 ‘AVIS’ RMYC Restricted Class built 1906. ‘An unexpected friend‘ by Jack Hilton. I think it best I start from day one, re my love/hate relationship with ‘Avis'! Seeing It for sale in June last year. I thought it would be just the thing to convert into a canal cabin cruiser. Since I live only about 80 yards or so from the Leeds & Liverpool canal. Talking my wife into coming to view it was the hardest part since she was insisting on visiting her relations. On arriving at Glasson Sailing Club where the boat lay, we made our way to the grave-yard where ‘Avis’ was shored up. Although still not speaking to me, my wife having seen 'Avis' first said: "Isn't she wonderful". I couldn't see but since I'm here just to keep the peace said: "I‘ll take a look at her." Looking at 'Avis' from every angle, I could feel my head ‘shaking’. The yacht itself seemed to be screaming out for help. I thought I'd look round for the ‘keel' which seemed to be missing, not to worry perhaps someone had taken it off and laid it near to hand. Then l had a brilliant idea, that was to leave the thing off and blank the slot for the centre plate with a plank of pitch pine or something. I was now slowly recovering from the shock of the work I was about to take on. I thought I'd get a little closer to her, so finding a ladder with a few rungs in it l was able to get on deck. Alter pushing back the hatch. I climbed down into the boat. One of the garboards was a little loose, but very sound. Planking and frames also. Pine on oak at 9 in. centres. l knew there was supposed to be a Stuart Turner engine with her, also some other odds and ends. I felt much calmer by this time. Someone had made a good job of stripping it over the years. Sailing boat bits did not have any interest for me anyway. It had recently had a newish cabin built onto it. I had to phone the owner that evening, having done so, he could tell me there were some fittings and other equipment, engine. etc. And he mentioned some sails also, but my mind was not working properly at that time. I was thinking what it was going to look like on the Canal. My main concern was the engine, what was it going to be like regards condition etc. My son's a very good mechanic so there wasn't much chance of slipping up there. After driving down to Manchester to see the owner, introductions over, he began to tell us of the photos he had of 'Avis' etc. past owners and history. It's strange how you can start to think in the terms of owning a ‘real yacht’, having had no real interest before, but the reality was starting to creep in. The photos of ‘Avis’ were taken in 1928 with her and others of the same class. 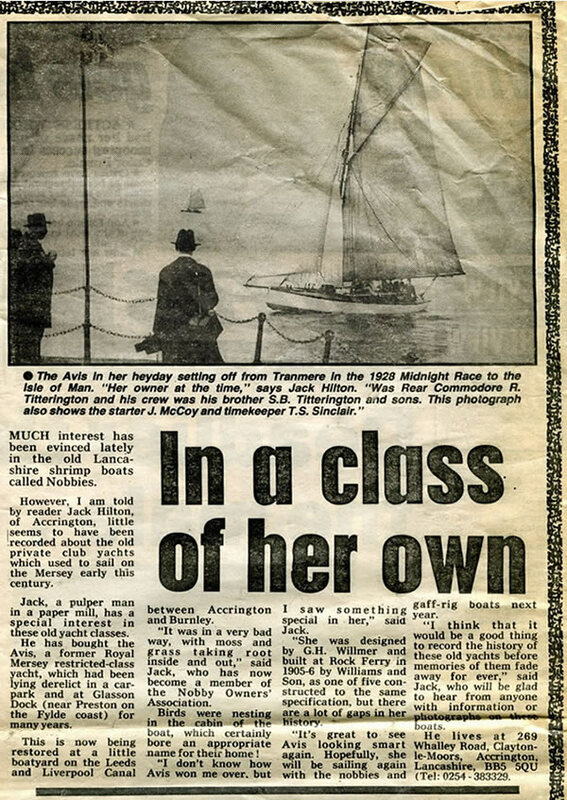 when they took part in the Tranmere Sailing Club ‘Midnight Race‘ to the Isle of Man. Getting back to the equipment for ‘Avis’. he could show me a full set of ‘new’ modern sails for her, plus running and standing rigging, winches, and various fittings. Also a Sestral Moore compass, a depth sounder, 'new' bowsprit, the gaff, boom and many other things. The Stuart Turner was a new factory rebuilt job. Engine oil was still in the dry sump, from leaving the factory. I started to get that ‘strange feeling‘ in the pit of my stomach again. It was the realisation of having to adjust very quickly to the idea of being a proud owner of a gaff rigged yacht. My dreams of sailing it down the L&L (ed; Leeds & Liverpool canal) were gone but, feeling very sure of myself I said, "I'll ring you tomorrow and arrange for someone to deliver it all, after which we'll settle up." I thought that will give me plenty of time to decide. ‘Oh, that's no problem‘, said he. "I've got a 7-ton lorry here", so that was it - I had bought ‘Avis’.